Style is something noticed immediately when someone opens your website. Before reading anything, the user gets a visceral sense of who you are and what you’re about. Your color scheme should be modern, typically with one or two colors that dominate. Fonts should be stylish but not difficult to read. And your branding message should be clear and obvious from the get-go. Don't try to be fancy or complex with the value you bring. Websites used to be laid out like books and newspapers, in block form with boxes and tables - think brochureware. Today, websites are more pleasant to the eye when they are free-flowing with featured areas that stand out, along with large buttons for easy navigation. Remember that a majority of visitors to your website may be using a smartphone or tablet to access it. Your layout should be responsive and easy to view on a variety of devices. Older websites have a tendency to feel cluttered and full. Cramming too much information onto the page has a negative effect and may lead the reader to give up. Feature your most important information at the top of your home page, with the goal of drawing readers in and leading them to scroll down or clicking into another page when they want to read more. There is a classic tendency to want to include everything on your home page. Resist that. It's like a clothing store putting men, women's and children's clothing right at the front door - potential customers would walk in, get overwhelmed and then walk right out. Websites that are not easy to navigate require a great deal of patience. And today’s web visitors are notoriously impatient. In fact, if your website even takes more than two seconds to load, you begin losing users. And if your visitors have to fumble around your site looking for the information they need? They’re likely to give up. Be strategic and thoughtful about any videos, animations or rotating banners you may want on your home page. Your visitors may be gone by the time they load. Websites built more than just a few years ago may have difficulty functioning in today’s internet world. Websites can begin to look slightly “off” with incomplete borders, text that overlaps photos, or other items that simply are out of sync. This may be due to incomplete code or lack of browser testing. Your website should work well on all browsers, including Safari, Firefox, Chrome, and Internet Explorer. In addition, it should be equally functional on both PCs and Macs. As mentioned earlier but bears repeating, in this day and age you should also be aiming to make your site mobile-friendly. Be sure the web developer you are working with has the capability to test these aspects. Honestly, not every company is in the best position for a redesign at any given moment. It may have to do with timing, lack of budget, your company’s goals, or other factors. Here are some reasons that postponing your website redesign might be in your company’s best interest. If you aren’t sure where you are headed as a company, waiting might be your best bet. Once your company has declared its vision and goals, then you’ll be more prepared to establish yourself with a clearer online presence. Don't think your website redesign will bring clarity to poorly defined business goals or strategy. You will need an employee with decision-making authority and possibly a marketing manager or specialist who can load content, build workflows and monitor the new website. If you don’t yet know who you are trying to reach, it’s important to figure that out first. Focus on narrowing down your target audience, branding your company, and then redevelop your website when you have these other items in place. Simply because you don’t have visitors converting to leads on your site does not mean you need to rebuild what you have. It is possible that your site actually looks and functions fairly well and simply just needs to be restructured with better content. If you're attracting visitors but not generating more leads that may point to a problem with the content on your website - either the website pages themselves or downloadable content. If you’ve been through a recent redesign but things still aren’t “clicking," it is possible that your business just needs something else. You may simply need a CMS (content management system), better content, or a research project to determine who you are reaching. 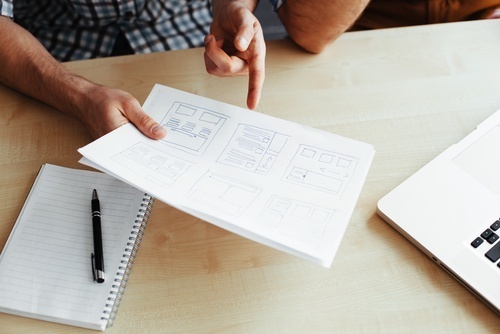 Before assuming that a website redesign is what you need, do a bit of research to make sure the other aspects of your business are in place first. Review the leads you are generating outside of your website and the percentage that convert. See if you can mimic your most successful sales processes on your website to create a digital salesperson for your company.